Silverton Mill is located within the National Trust estate of Killerton in Devon. A requirement to remediate the site as part of the lease surrender, provided an opportunity to incorporate significant ecological enhancements into the project. The culverted River Culm runs through the centre of the site and formed the core focus of the design proposals. 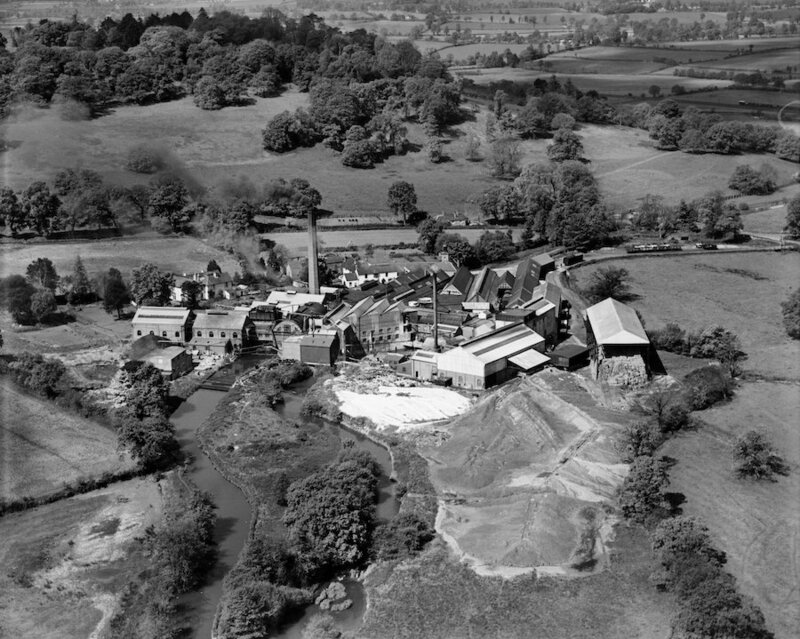 The project saw collaboration between the National Trust (land owner), DS Smith (leaseholder and operator of the mill), John F Hunt Remediation (remediation contractor) and the Environment Agency (regulatory stakeholder). The former paper mills’ operational history dates back to the 1800’s. This industrial heritage had left its mark on the local ecology and also led to significant contamination on site. Prior to the remediation works commencing, the mill spanned the River Culm (culverted) and a small covered culvert ran along the length of the site. 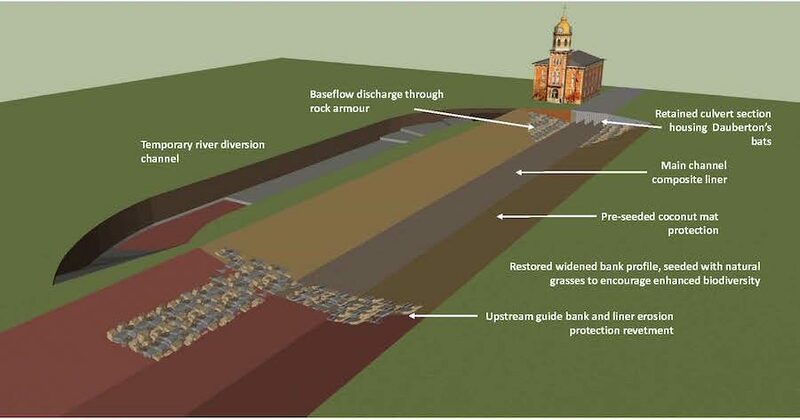 A significant issue for the site was its susceptibility to severe spate flooding, caused in the main by the culverted sections. Ecology surveys identified maternity roosts for Daubenton’s bats within a section of the culvert and brown long-eared bats were found to be roosting within the mill itself. In addition, small numbers of reptiles were present on site and due care needed to be taken with regards to aquatic species. 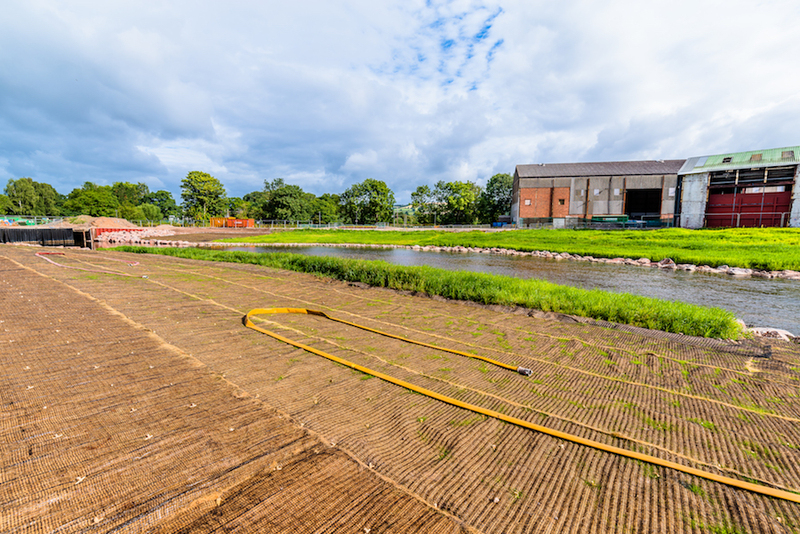 In order to address the main issues of contamination, the mill buildings and culverted river were demolished and the contaminated ground beneath it was excavated and treated. 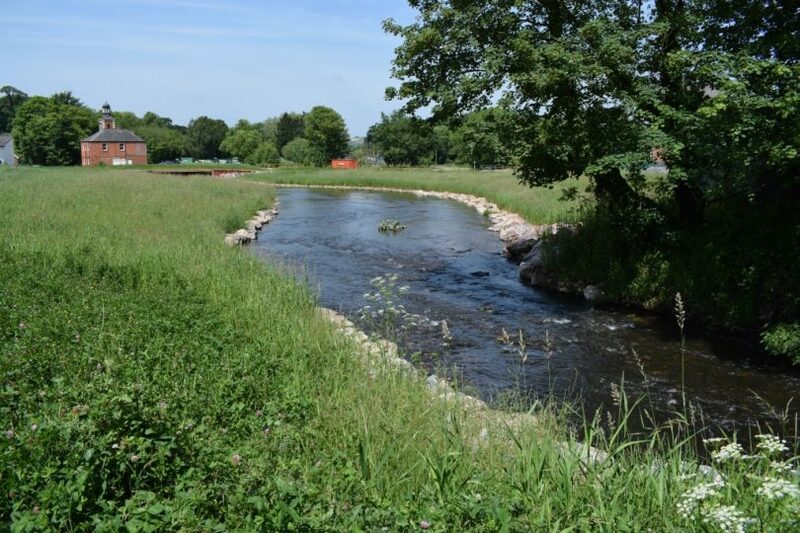 The River Culm was then reinstated with enhanced ecological benefits, in addition to the installation of a groundwater baseflow alleviation system, rock armour flow protection and new grassed embankments to address the issue of flooding. The new river channel was designed so that it allowed a degree of natural freedom for the river to find a stable regime. In order to facilitate the works, the River Culm was diverted temporarily with agreement from Environment Agency fisheries officers, so that spawning periods were avoided. A series of design iterations and stakeholder meetings culminated in the ecological design enhancements being finalised. Early stages of the project included fish capture and relocation, in addition to appropriate mitigation for bats and other species on site. A 40m section of the existing culvert was retained and enhanced to provide a suitable roost site for Daubenton’s. A bat curtain was installed to prevent bats entering the river culvert during the breeding season. In addition, bat boxes were installed at strategic locations around the site. 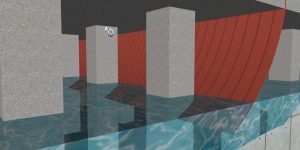 Movement corridors were reinforced using interconnected planting, waterbodies and landscape features. The flow and alignment of the relocated river was designed to ensure that it would be self-cleansing. Habitats were designed and constructed in order to support protected and priority species, the aim being to encourage and increase, diversity, populations and coverage in the coming years – a species monitoring programme undertaken by the National Trust in collaboration with the Environment Agency will provide valuable data. Suitable access was provided to allow local people to view the wildlife and habitats in a natural setting. A wildflower seed mix was developed with the collaboration of the Environment Agency’s Biodiversity Officer and wetland restoration specialists ‘Salix’. Native grasses, sedges, rushes, reeds and herbs were planted, with appropriate seed mixes matched to the future ground conditions. The newly formed river banks were completed in July 2016 and the upper banks were completed in January 2017. The ecological mitigation and enhancement is therefore at a very early stage of establishment. However, as of June 2017, only 6 months after completion of seeding, the presence of perch, pike, kingfisher, green sandpiper, dippers, grey wagtail, goosanders, geese, swallows, swans and dragonfly have been reported in the restored area. Further Information: John F Hunt Remediation are a specialist remediation and enablement works contractor, working in the contaminated land, construction, infrastructure, utilities and environmental sectors. Our in-house team of remediation specialists work in a collaborative manner with all project stakeholders, to ensure technically proficient and cost-effective solutions. Project information provided by John F Hunt Remediation.